This past Sunday, the 6th Sunday of Easter (year C), the First Reading is Acts 16: 6-15 (English Standard Version) which I have reproduced below. This is a crucial narrative in Acts as the report of the first convert and the first Baptism in Europe. Please note that in the first paragraph the Lord prevents the apostles from going to certain regions and then He directed them into Macedonia, that is, Europe. 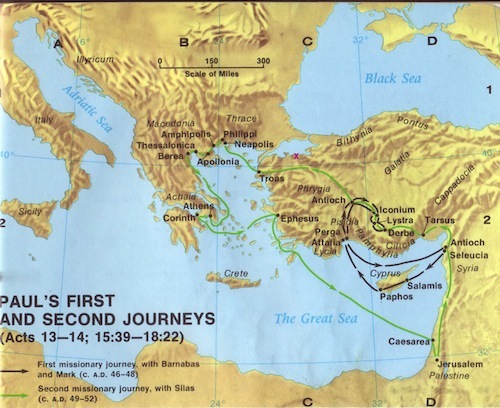 Further, in their travels to Philippi the apostles had a quick trip given the circumstances at the time. After the lesson, I have commentary. Yesterday, I met with a retired colleague and friend, Art in his new residence at a assisted living facility. We went out for lunch. Art was for years a missionary in the Caribbean. He pointed out that with my new job as hospice chaplain in our area that I would have greater exposure to the community in that role. This might be good for the mission, he said. Then he said that the Lord opens opportunities for us and we don’t have to force the door open. This observation is spot-on! So much so-called missionary work, not only abroad but also here, is forcing the Lord to open doors by various stratagems, techniques and gimmicks. Door to door salesmen, when the homeowner (usually a woman) was about to close the door would stick his foot in the door; and so the expression, “get a foot in the door”. This must have been frightening. This is not the way of the Lord as the Acts passage makes clear. He opens the door for His faithful apostles and in the apostolic ministry. The Lord is Lord of the harvest. We pray to Him for His harvest (Luke 10:2). We don’t tell the Lord when the time is right. He and His field does! John 4:35: Do you not say, ‘There are yet four months, then comes the harvest’? Look, I tell you, lift up your eyes, and see that the fields are white for harvest. Art was reflecting the reality of the Lord’s time. In a harvest, the right time is the ripe time and we can do nothing to ripen the harvest but be prayerfully ready to harvest.